Hafpor Julius Bjornnson, alias ‘THE MOUNTAIN' will appear at Carmunnock Highland Games 2018 as our Chieftain! Another Incredible Day in Carmunnock – thanks to all for coming and making it such a special occasion. 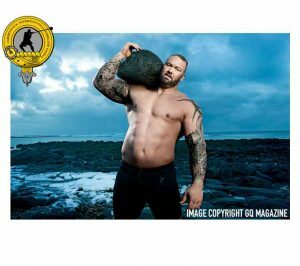 Thanks also to our Chieftain, Hafpor Julius Bjornnson, alias ‘THE MOUNTAIN’ from the hugely successful TV series Game Of Thrones, Europe’s Strongest Man 2018, World’s Strongest Man 2018. Hafpor amazed the crowds by absolutely smashing the 56lbs SHGA weight for height record in Carmunnock! Congratulations also to English athlete Scott Rider, the current Highland Games World Champion and reigning champion at Carmunnock! Welcome to the official site of The Carmunnock International Highland Games. We look forward to seeing you again next year in the beautiful setting of Glasgow’s last remaining conservation village. The event is being held on SUNDAY 26th MAY 2019 at the King George V Playing Field in the centre of Carmunnock. Gates open at 11.30am and the games begin at 12.30pm. In 2018, our Chieftain was none other than World’s Strongerst Man 2018, Europe’s Strongest Man 2018, actor ‘The Mountain’ from Game of Thrones, Hafpor Julius Bjornsson. Hafpor absolutely smashed the SHGA 56lbs Weight for Height record on the day – a staggering achievement! Thank you Hafpor for fulfilling the role of Chieftain! This year, along with the traditional Men’s International Highland Games we saw the return of Vadim’s Highland Warrior Challenge, featuring 8 highly trained individual contestants battling each other in 3 events – Log Fighting, Freestyle Combat & Stick Fighting (for more information see the ‘About’ section). Our hugely popular Community Challenge also returned with locals competing in 2 man teams in events such as “The 2-man Pole Push”, “Bale Rolling” & “Taxi Pull”. Why not enter your team now to challenge our reigning champions in 2019?! We also have Individual Events such as “Swingle Tree” and “The Manhood Stone Lift”. And it goes without saying, strictly for ladies only, the hugely popular “Welly Throw”! The kids can also get involved with races for all age groups and lots of activities! Other attractions include stalls selling refreshments and food, bar area with live music by local musician Fozzy, local businesses selling a wide range of gifts and goods, traditional Scottish bagpipes and dancers, fabulous tribal sounds, not to mention lots of entertainment for the kids including bouncy castles, fun rides, races, tattoos, face painting, caricatures, sweets & cakes, ice-creams and jewellery! All of these fantastic attractions, into what is already a hugely successful event, increase the scale and status of Carmunnock International Highland Games, and provide a real spectacle for everyone to enjoy! It really is a great event and at only £7 for adults and £4 for children & OAP’S, the best value games in Scotland! We look forward to seeing you in 2019! Keep an eye on our ‘News’ section for updates and announcements. Book Tickets Now & Benefit from our early booking discount! At the gate on the day of the games – gates open at 11.30am, arrive early to secure a great spot in the field!